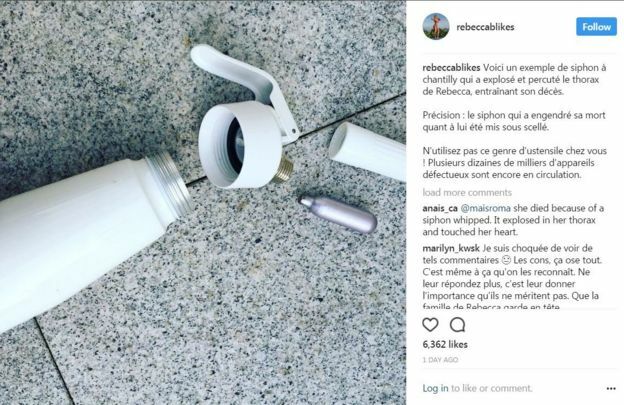 A well-known lifestyle blogger in France has been killed by an exploding whipped cream dispenser. Rebecca Burger's death was announced on Facebook in what her family called a "domestic accident". A warning against the faulty dispensers was posted to her Instagram account, saying it had "exploded and struck Rebecca's chest, causing her death". French media reported she had died of cardiac arrest after the incident, despite medical attention. The popular fitness and travel figure was well-known in France, with some 55,000 Facebook fans and 154,000 followers on Instagram. One of Burger's family members took to Instagram, warning readers not to use the dispenser, saying that tens of thousands of "defective devices" remain in circulation.